If there is one musician who characterizes 90s rock, it is Eddie Vedder. Vedder's band Pearl Jam walked through the door opened by Nirvana and became one of the biggest selling acts of the decade and the poster children for mainstream grunge music. Much like Nirvana's late Kurt Cobain, Vedder struggled with his fame from the start. Although he remains a much-loved musician, Vedder continues to keep a tight control on his personal life and rarely grants interviews or engages the press. Eddie Vedder was born Edward Louis Severson III in Chicago, Illinois. His mother, Karen Lee Vedder, and father, Edward Louis Severson, Jr., divorced when Vedder was a baby. His mother remarried a local attorney, Peter Mueller, very shortly after her divorce. Vedder grew up as Edward Mueller and believed that Mueller was his biological father. His mother had three more children with Mueller, and the couple also served as foster parents for seven other children. When Vedder was 14, the family moved to San Diego, California. Vedder found the transition difficult, and it was during this time that he began turning to music. When he was in high school, his mother and Mueller divorced, and Vedder found out that Mueller was not his biological father. Vedder attempted to find his birth father, but discovered that he had died a few years earlier. Vedder moved out of his mother's home and got an apartment in his senior year of high school. He also got a night job at a drugstore to support himself. However, the pressure proved to be too much and he dropped out of school and moved back to Chicago. During this time, he adopted his mother's maiden name of Vedder. After a few years in Chicago, during which he earned his GED, Vedder returned to California with his girlfriend. He played with a few local bands, including Bad Radio, and began recording demos. He recorded a demo version of a three song mini-rock opera that drew from his own life story. The opera started out telling the story of a young man who grew up thinking one man was his father, only to discover that the man was not his father and his real father was dead. In the story, the young man becomes a serial killer and ends up getting sentenced to death. This three-song demo proved life changing. The three songs would become Alive, Once and Footsteps - successful songs from Pearl Jam's first album. However, first, the demo would earn the attention of Mother Love Bone in Seattle, who invited Vedder up to audition for their band. Eddie Vedder moved to Seattle, which at the time was the epicenter of American music, thanks to the explosion of grunge into the mainstream. Vedder played with a few local bands and on a few local projects that are now legendary parts of 90s alternative rock history, including Mother Love Bone and Temple of the Dog. Things really took off for Vedder, however, when he was recruited into Pearl Jam. Pearl Jam was formed in 1990 and signed to Epic Records in 1991. Although bands like Nirvana and Sonic Youth had broken through to the mainstream, Pearl Jam became the crossover grunge act of the decade. Their first album, Ten, became one of the top 10 selling albums of the 1990s. Their follow-up album, Vs., broke the then record for most number of albums sold in a debut week. Everything from Time magazine to multiple Grammy Awards followed. Pearl Jam boycotted Ticketmaster in the mid-1990s to protest their service fees, which meant Pearl Jam was extremely limited in their venue choices. Their inability to play live had absolutely zero impact on their popularity. For Vedder, the fame was hard to take. By the time Vs. was released, the band agreed to do only limited promotional work on subsequent releases. Since Vedder carried the majority of the fame for the band, they all agreed to limit the press to take the pressure off of him. Pearl Jam's popularity waned by the late 1990s, as musical styles changed, but the band continues to tour. In 2009, the band released their ninth album. Once some of the fanfare surrounding Pearl Jam had subsided, Vedder launched a solo career in the 2000s. When not working with Pearl Jam, Eddie Vedder does smallish, solo club shows. His solo debut was the soundtrack to the film Into The Wild. 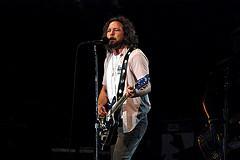 Vedder also remains active in musician rights causes and is an advocate for independent music.